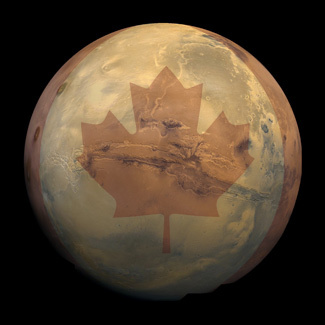 When they get to Mars, future Canadian astronauts won't find a Tim's waiting for them, but if they're lonesome they can always touch down in Tignish or spend Canada Day in Kamloops. Tignish and Kamloops being craters, that is, and among 75 geographic features on planets and moons in our solar system named for Canadians or Canadian places, says John Koulouris, of Laval, Que. Besides Tignish, P.E.I. and Kamloops, B.C., there are craters on Mars called after Maricourt, Que., Banff, Alta., Kincora, P.E.I., Canso, N.S, and Gander, Nain and Nutak, N.L., to name a few. The task of naming extraterrestrial features is handled by an International Astronomical Union committee with the unwieldy moniker of the Working Group for Planetary System Nomenclature. The IAU sets the rules for naming geographic features in the solar system from volcanoes on Venus to asteroids, moons and Martian craters, says Koulouris, who describes himself as a writer, planetary cartographer and computer buff. "There are quite strict criteria which must be met before a city or town name can be considered, including that it ... doesn't share its name with any other city, and that the population must be under 100,000," says Koulouris. Names are taken from mythology, literature and countries from around the world, and include over six dozen with Canadian connections. In the case of Mars, large craters are named for prominent writers or scientists. Smaller ones are named after towns with a population of less than 100,000, says Koulouris, whose hobby is submitting suggestions for names on Mars and other planets to the IAU - among them Kamloops and Gander. The Martian crater Gander is in the southern hemisphere of the Red Planet. The Tignish crater is just west of Gander, says Koulouris, and just to the south is Penticton, named for the town in the interior of British Columbia. Gander Mayor Claude Elliott said he was delighted to learn of the Mars connection to his town. "This is obviously a tremendous honour for us, but the fact that it recognizes our efforts to seek out new technologies and bring the people of the world closer together, makes it that much more significant," Elliott said. But Mars isn't the only place a weary Canadian space explorer could find a link to home. The Ontario Lacus region on the surface of the Saturn moon Titan is named for Lake Ontario. And the Vibert-Douglas Patera region of Venus is named for the Montreal-born Canadian astronomer Alice Vibert Douglas, says Koulouris. In fact, he says, features on Venus are routinely named for famous women - another being Canadian painter Emily Carr, who has a crater name for her. Other names come from literary works or mythology, says Ted Bowell, an astronomer at the Lowell Observatory in Flagstaff, Ariz. and a member of the working group on nomenclature. Among them are figures from Inuit mythology in Nunavut author Michael Kusugak's book Hide and Sneak, he said. The suggestion for Saturn's moons Kiviuq, Ijiraq and Paaliaq was made by British Columbia astronomer J.J. Kavelaars, who was part of a team that discovered 12 moons around the planet in 2000, and has his own claim to a chunk of solar system real estate with an asteroid named in his honour last June. Kavelaars, who works at the Herzberg Institute of Astrophysics in Victoria where he's part of a team hunting objects beyond Pluto, said he was thrilled to put a Canadian connection on the new moons. "Prior to that, the IAU was using Shakespearean characters for those satellites, but I was hoping we could adopt some sort of naming theme that was more connected to the individual doing the research," he said. "I was living in Ontario at the time and I went looking for some Algonquin names, but one night I was reading to my kids from this book by Michael Kusugak and I thought 'these are good names'. " More information can be found at http://planetarynames.wr.usgs.gov/. Photos: Deadly winds hit U.K.